Lyft, just days into its existence as a publicly traded company, is drawing unwanted interest from Wall Street’s pessimists. One way to gauge their interest in a stock is to look at the number of shares that are being lent, and as of Tuesday, 6.6 million shares, or $455 million worth of Lyft, were on loan, according to the data provider IHS Markit. That was equal to 20 percent of the shares actually available for trading, known as the float. By comparison, just 2 percent of Twitter’s float, and a similar amount of Snap’s, was on loan at the same point after their initial public offerings. For Facebook, that percentage was 5 percent. Currently, the shares on loan from Facebook and Twitter total fewer than 1 percent, and at Snap they’re nearly 9 percent. The percentage of shares on loan at Lyft is roughly equal to the level at Tesla, the electric-car maker, whose chief executive has waged a very public fight with short-sellers, accusing them of conspiring to bring his company down. 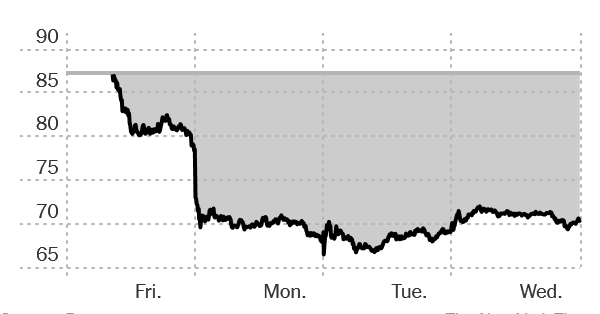 Since making its public market debut on Friday, Lyft’s stock has stumbled. Shares are trading at $70, below Lyft’s I.P.O. price of $72 and off more than 20 percent from their opening trade. But the company’s debut was a test of investor appetite for fast-growing but unprofitable tech companies. While Lyft’s revenue more than doubled last year, it lost nearly $1 billion, and a number of Wall Street analysts have questioned whether it can maintain its current growth trajectory. The short-sellers are betting it can’t.